How to get list of all tables’ and its index sizes along with row count looks very simple ? We do have the solution for it. Either you can use sp_spaceused or you can use one of my own solutions. But things became strange when I tried both solutions on SQL Server 2014 having memory optimized table and both solutions return zero for memory optimized tables. 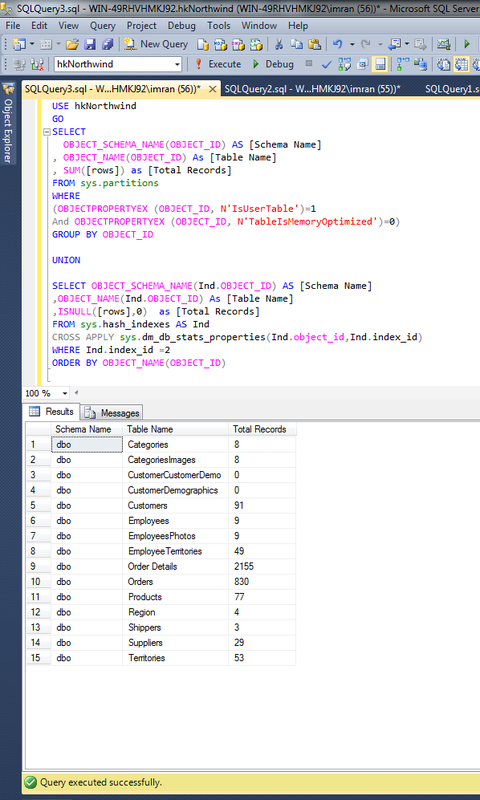 Given below is the script and its output in SQL Server 2014. As you can see in the above image, all memory optimized tables showing zero result. Oopsssssss. So what is the solution ? I started my research and developed a solution . Given below is the script. 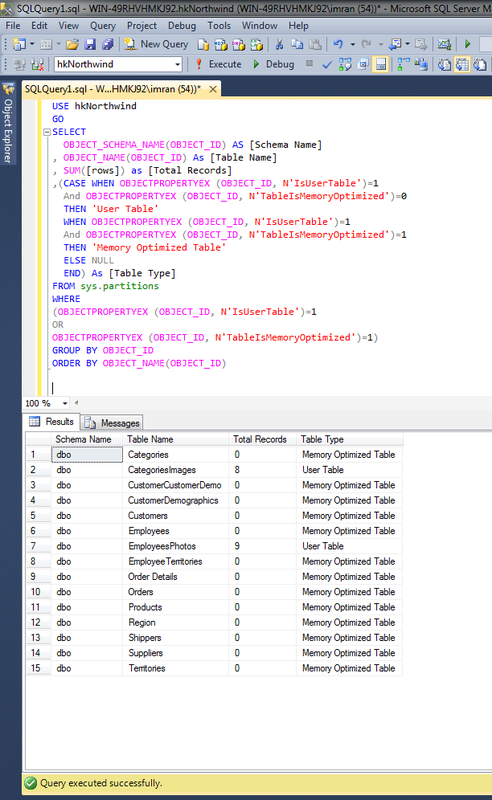 As you can see in the above script (solution), SQL Server 2014 handles disk based table and memory optimized table space, index space and row count separately. So you need to calculate it separately. Let me know if you came across the same situation and its solution. I have written multiple articles on memory optimized table and its handling. I was also working on its core area that is its performance. I continued with my research to see whether it really improves the performance or not. And as per my research, I found a massive improvement in the performance (except few limitations). Before proceeding with the performance, I would like to create a sample to compare the performance between disk based & memory optimized table. 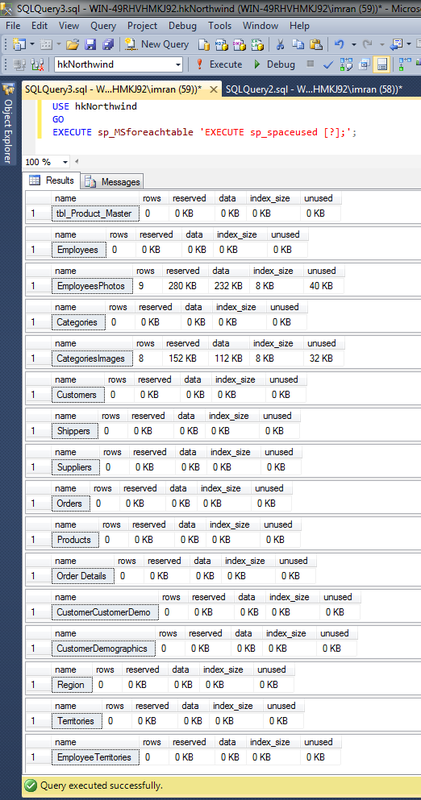 Let me create sample tables for memory optimized table and insert bulk data in it to measure the performance. Given blow is the script. 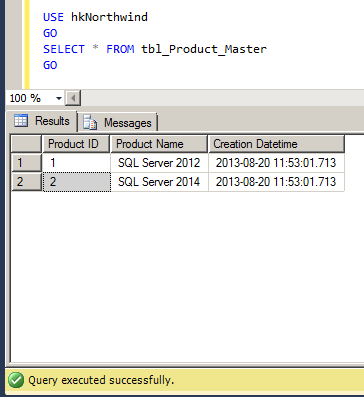 --Given below scripts are compatible with SQL Server 2014 and above. --This script may take few minutes to insert records. ---Create native compiled procedure to give boost to memory optimized table. Let me create sample tables for disk based table and insert bulk data in it. --Insert 65536 records into the disk based table. Let’s proceed with the different categories of performance comparison between normal table and memory optimized table. 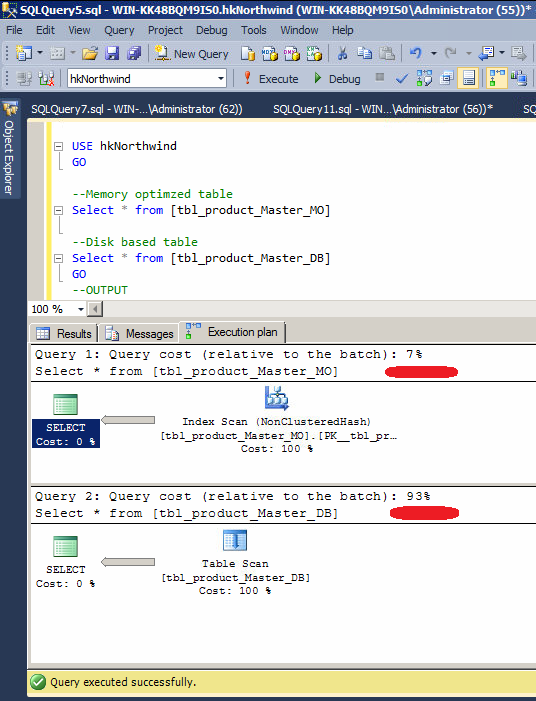 Let us start with the query cost related to the batch. Given below is the script and its output. Note : Given below results are tested on 300K~ records. As you can see that memory optimized table only took 7% but on the other hand disk based table took 93% for the same task. Let’s turn on the time statistics and view the performance comparison. ---Given below is the Memory optimized native compiled stored procedure. --This stored procedure we used to browse memory optimized table. --It will give boost to memory optimized table performance. CPU time = 93 ms, elapsed time = 1706 ms.
— For disk based table. CPU time = 234 ms, elapsed time = 3251 ms.
and due to this, it produces a high level performance. — For disk based table query. 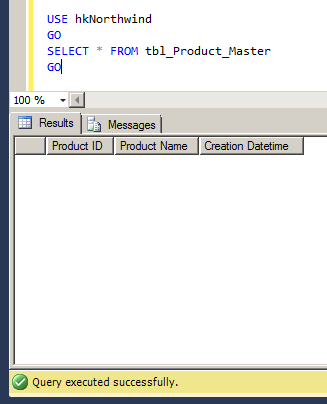 Table ‘tbl_product_Master_DB’. Scan count 1, logical reads 1962, physical reads 0, read-ahead reads 1584, lob logical reads 0, lob physical reads 0, lob read-ahead reads 0. I am very much impressed with the memory optimized table performance. But still it requires some improvement regarding BLOB data types & validations. Given below is the consolidated summary that will give you a glance performance review of disk based vs memory optimized table. Let me know about your test results. Recently, I was doing some research on memory optimized table and I came across a situation where I needed to keep some temporary data in the tables. So I thought of creating temporary table. Now I have two choices, either to go for disk based temporary table or to go for memory optimized temporary table. I decided to create a memory optimized temporary table. The feature ‘temporary tables’ is not supported with memory optimized tables. If I am not wrong, you cannot create a memory optimized temporary table because this feature is not supported by memory optimized table. So I started my research and tried to find out the work around that can help me create a memory optimized temporary table. Finally I came to know how to create a temporary table in memory optimized table. As you can see, I just added one argument (DURABILITY = SCHEMA_ONLY) at the time of memory optimized table and because of this argument, the table is converted to a temporary table. Let me know if you came across this issue and its solution. Today, I came across a situation where I had to get the total number of records in each Memory optimized table in a particular database. I remember developing a solution earlier (How to get the number of records in a disk based tables. ). I tried this solution on memory optimized table but it did not work. Ooopssssssss. Given below is the script that we use to get the number of records in a disk based table. I included the table type in the query to demonstrate the problem. As you can see in the above example, it only returned the total number of records in disk based tables and returned zero for memory optimized table. So I started doing my research and found the solution. Given below is the script. Note : Before executing the above query make sure that all your tables’ stats are up to date. Memory optimized table is a new concept to maintain records in table with high performance. I already discussed this new type of table earlier in my article. So, I kept on researching for this new feature and came across an issue. The issue is, I once created a memory optimized table and inserted few records in it and did other research work on the test database and once I was done, I just shut down my machine. Next morning when I tuned on my machine, I found no data in the memory optimized table. First I thought I deleted the data by mistake and forgot it. So I repeated the process but the following morning same thing happened to me again. I could not comprehend what on earth was going on !! I was puzzled and started doing my research and finally resolved it. 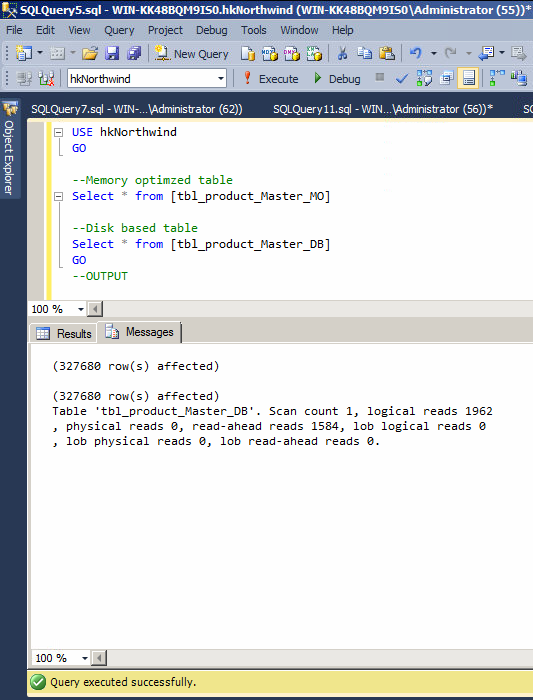 Create a memory optimized table in a memory optimized table enabled database. --This script is compatible with SQL Server 2014 and above. Insert records in the memory optimized table. Browse the memory optimized table. Now either restart the database server or shutdown your test machine and turn it on. Never do this exercise on production server without taking proper precautions. Opsssss, now you can see the data gone and the reason behind this is, just a parameter that we passed at the time of memory optimized table creation and this is DURABILITY because if you make DURABILITY = SCHEMA_ONLY the schema will be durable but not the data. Once you restart the database server, you will lose your data. 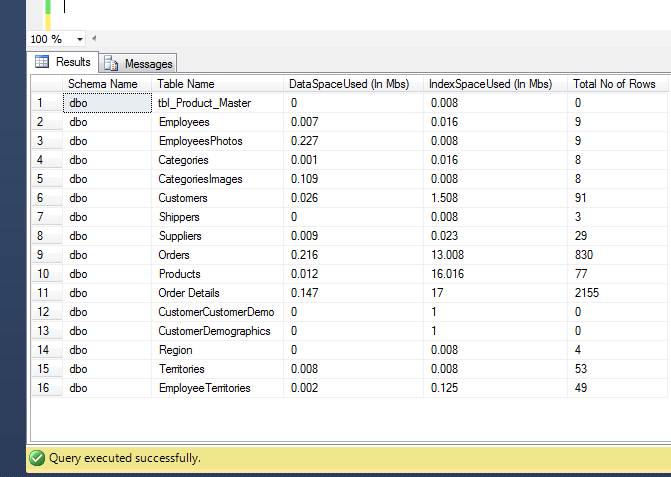 Remember, whenever you create a memory optimize table, to keep the durable data (permanent data). Always use WITH (MEMORY_OPTIMIZED = ON, DURABILITY = SCHEMA_AND_DATA). Note : If you create the memory optimized table without passing DURABILITY parameter, by default it will be DURABILITY = SCHEMA_AND_DATA. Lets recreate the memory optimize table. Given below is the script. Do the same process again without step 1 and your data will remain with you. Please let me know if you come across this issue and its resolution.